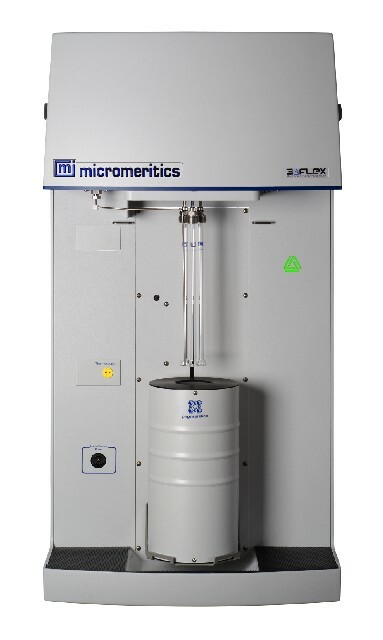 Micromeritics 3Flex Surface Characterization Analyzer is a fully automated, three-station instrument capable of high-throughput surface area, mesopore and micropore analyses with superior accuracy, resolution and data reduction. Each analysis station can be used for either mesopore or micropore analysis, with its own transducer for simultaneous sample analyses. With its many advanced features, the 3Flex was designed with a single focus; to improve analytical results. Interactive data manipulation permits user to accurately and precisely determine surface area and porosity. User selectable data ranges through the graphic interface allows direct data modelling for BET, t-plot, Langmuir, and DFT interpretation, minimizing time to results.